Once upon two years ago at my friend, Debra’s, yearly holiday cookie party, sitting on her couch in the next room was none other than JK Simmons. Weird, right? I calmly walked into the kitchen where Debra and her wife were mixing dough for about 800 cookies. I said “Debra... there’s a movie star in your living room.” She laughed and explained that JK lives in her neighborhood and their kids attend the same school. Never in my wildest dreams did I think I’d run into Mr. Simmons again, unless it was at another one of Debra’s cookie parties! 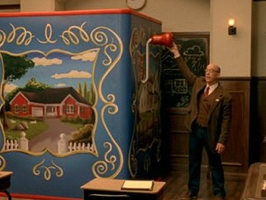 But I did run into him, because I had the pleasure of designing a HUGE jack in the box for one of the many Farmers Insurance commercials for which JK Simmons stars in as Professor Nathanial Burke. He’s a very pleasant fellow, and enjoys holiday cookies, it turns out, with the same amount of verve that I do. The whole shoot is documented in great detail on my Behanced Page, but the main stills are hanging out on this site in my portfolio. JK Simmons turns the crank on this 8 foot Jack in the Box illustrated by yours truly.